- Claudio Puelles was scheduled to face Devin Powell at the event. However, Puelles pulled out of the bout in mid-October with an undisclosed injury and was replaced by promotional newcomer Jesus Pinedo on October 17. - The Ultimate Fighter: Latin America 2 lightweight winner Enrique Barzola was expected to face Nad Narimani at the event. However on October 26, it was reported that Barzola pulled out of the bout due to an arm injury and was replaced by promotional newcomer Sergio Giglio. In turn on November 8, it was reported that Giglio was forced out due to injury and was replaced by fellow newcomer Anderson dos Santos on November 8. - Tom Breese was expected to face The Ultimate Fighter: Brazil middleweight winner Cezar Ferreira at the event. However on November 9, it was announced that he pulled out of the event due to injury and was replaced by promotional newcomer Ian Heinisch that same day. 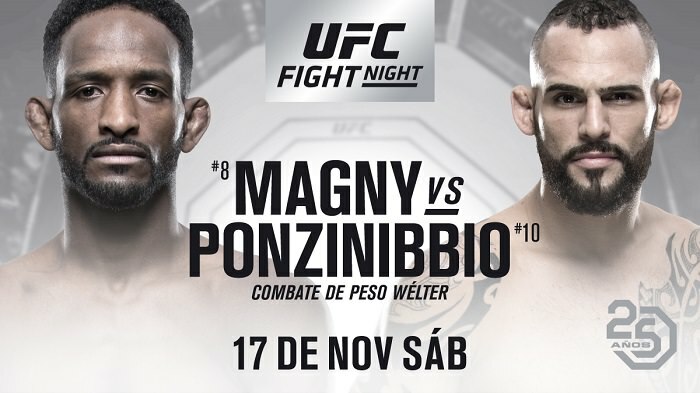 Feels like Magny is drawing close to dead here. Would have to outgrapple Ponz and I don't see him being able to initiate that type of fight. Ponz prob dusts him fairly quickly or wins a lopsided decision. Narimani vs. dos Santos was a fun fight to open up this card. Hopefully the rest of the fights are just as good. Magny face-planted into the canvas.